Al Qaeda's Somali arm has hip-hop jihad rap and message from "American"
Intel expert says group is trying "to reach audience of potential recruits in America"
LONDON (CNN) -- The latest video from Somalia's al Qaeda-backed Al-Shabaab wing is as slickly produced as a reality TV show but with a startling message -- complete with a hip-hop jihad vibe. 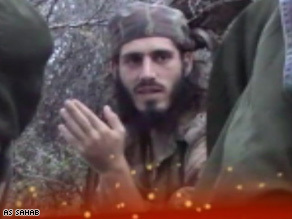 Experts think Abu Mansoor al-Amriki, dubbed "The American" by al Qaeda, speaks in the Somali video. "Mortar by mortar, shell by shell, only going to stop when I send them to hell," the unidentified voice raps on the video, which runs at least 18 minutes. The video also shows a man reported to be Abu Mansoor al-Amriki, dubbed "The American" by al Qaeda. He apparently is now in Somalia training and counseling Somalis from North America and Europe. He speaks in American English. Intelligence experts say the video was probably made in recent weeks and comes on the heels of an audio message in March purportedly from Osama bin Laden. In that recording, the al Qaeda leader calls on his "Muslim brothers in Mujahid Somalia" to overthrow President Sheikh Sharif Sheikh Ahmed for cooperating with the West. Al-Shabaab is the militant Islamic wing in Somalia. It means "Youth" in Arabic. "We're seeing perhaps their most sophisticated attempt so far to really reach an audience of potential recruits in America, and that's one of the things that made that video very significant," said Ben Venzke of the IntelCenter, a Washington-based research group that tracks al Qaeda's development and messages. "They're casting it in a way that's going to speak to the youth of today," Venzke said. "Most of the time, what we're seeing in their videos directly parallels what the groups are doing operationally, what they are targeting, where they're recruiting." Sheik Ahmed Matan knows that firsthand. A respected member of Britain's Somali community, Matan said he knows of hundreds of young Somali men who have returned to Somalia for terrorist training. "A lot of young people from here, from America, from Canada, from everywhere from Europe -- they went there," he said. He added that these men are capable of being sent back home to conduct terrorist operations, even suicide bombings. "It can be, they can train anytime and send them here, anytime," Matan said. Somalis from North America and Europe are beginning to come to terms with the problem of recruitment, he said. The United States and British governments say Somalia is an emerging terror hot spot, which could pose a threat beyond its borders. Matan said he often challenges "recruiters" at mosques and elsewhere in Britain, demanding that they stop brainwashing younger Somalis about Islam. He said the government should play a greater role in monitoring what is said and done at these mosques -- but, he concedes, doing so has proved highly controversial in Britain and throughout Europe. There is some evidence that al Qaeda is successfully preying on some of those with Western backgrounds. One of them was a business student from London who suddenly left for Somalia. He surfaced about 18 months ago on a martyrdom video, just before blowing himself up in southern Somalia, killing at least 20 people, officials say. U.S. Defense officials, who spoke on condition of anonymity, also said months ago that one of their worst nightmares would be al Qaeda operating freely in Somalia. Now that nightmare continues, with Somalis in North America and Europe admitting that al Qaeda's reach is spreading. Venzke said Al-Shabaab has put out more videos than ever before in the past year. "If that's what they're doing publicly, we can only assume how their operations have developed," he said.